Last year I did the post you see below that I hope you read again showing how the so-called disaster for the GOP because of the government shutdown in 1996 was way overblown. The actual facts didn't coincide with the rhetoric during that time or even when mentioned now. I am not saying the results were great for the GOP but they were no way the disaster the media and Democrats [sorry for being redundant] portrayed them. What is amazing the same thing happened this last government shutdown, in October of 2013. Think about that, it was just over a year ago when the Democrats and mainstream liberal media laughed at how the Republican Party was split in two and how much damage the government shutdown did to the Republican brand. There was even talk that the Democrats could take back the House and no talk that the GOP could win the senate. What happened? A Republican tsunami wave in the November 2014 midterm election where the GOP picked up 9 senate seats [after Landrieu goes down], 12 house seats for one of the biggest GOP majorities in history, and 3 governorships, where the GOP has an overwhelming majority of the state houses in the country. And with all that, the revision of history is still alive. I just heard the other day Barack Obama say, the Republicans better not go down the road of shutting down the government. "How did the last one work out for them?," said Obama [implying that the government shutdown hurt badly the GOP]. Well I think it worked out for us just fine, Mr. president- check election scoreboard. I am not posting this trying to say a government shutdown would be a good idea or that the GOP should shutdown the government, as I actually don't think we should. I am just pointing this out to show the amazing revision of history that the liberal media and Democrats continue to spew out. To quote the great president George W. Bush: "Fool us once, shame on you, fool us twice...you can't fool us again." :-) I love that man. I've heard every single pundit pronounce how the Newt Gingrich [GOP] led shutdown in late 1995-early 1996 was a total disaster for the Republican Party. Even, and especially, many conservative Republican pundits have been saying how terrible the shutdown was for the GOP. They are doing that in light of today's Harry Reid's shutdown and saying how the Republicans should immediately cave into Reid and Obama and the Democrats because to not do so will be a disaster a la 1996. Let's see what those actual disastrous effects on the GOP were. From forexlive " during the government shutdown from Dec 15, 1995 to Jan 6, 1996, the S&P 500 actually rose 5 percent. 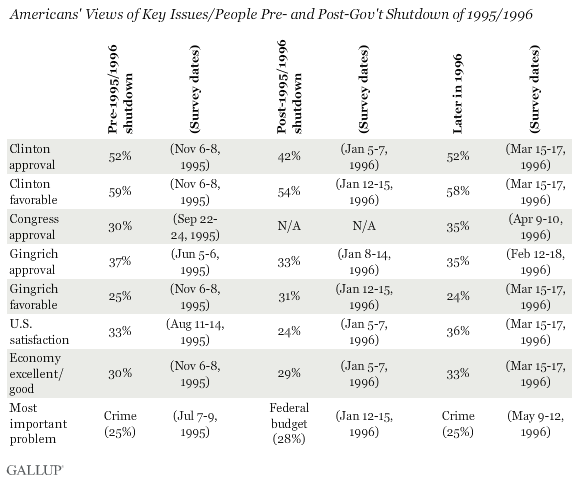 This amazing graph from Gallup this [Tuesday] morning on the effects of the GOP Gingrich led shutdown in 1994 where it shows Bill Clinton's approval remained steady pre and post [about 4 1/2 months later] at around 52%. Congress approval actually went up 5% between pre-shutdown and 6 months later from 30% to 35%. While President Clinton was re-elected [with less than 50% of the vote] over the weak Republican Bob Dole, lets see what happened to the congress. Despite Bill Clinton's re-election and despite the Democrats making a massive effort thinking they could regain control of the congress because of the shutdown, the Democrats only gained 8 seats and the Republicans won the House again! In the Senate the Republicans in November actually picked up 3 Democrat seats [and only lost 2 in a special election not held in November]. So, this supposed devastating GOP disaster that was supposed to wipe out the Republicans resulted in the Republicans winning the House again and actually winning seats in the Senate. Today even many liberals admit that it will be very hard for the Democrats in 2014 to win the House and even not lose seats in the Senate, but they will add, this is still a disaster for the GOP because it ruins their brand. Huh? Who cares about our brand if we win elections. Are they trying to say well, it might not hurt the Republicans in 2014, but wait until the 2016 presidential election. Are you kidding me? 3 years from now. We are told over and over from every political pundit I know that in politics a week is a lifetime, a year is a century, and 3 years is an eternity. So, an eternity from now the public may like the Republican candidate and not like the Democrat candidate but they will remember that the government shutdown for a few days in October of 2013? Really? As some of those stats are told to the pundits now, they will say, I don't care what they say it really was devastating to the Republican Party. I'm originally from Missouri-show me where. Interesting and true, Big Mike. When the GOP takes things like this off the table, it reminds me of Obama telegraphing how he's going to fight the Taliban, for instance. What good is a deterrent if you promise not to use it? Apparently, in this age, nothing is off the table for the GOP to prove how nice it can be. I hope it works. To use a phrase from my hippy days - Right on, Serv!! !